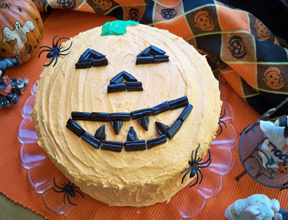 This Jack-O-Lantern pumpkin cake is a fun and easy way to get the kids in the spirit of Halloween. They love the little spiders crawling on the pumpkin face. Preheat oven to 350 degrees F. and grease and flour bottom and sides of cake pans. In a mixing bowl, cream butter until light and fluffy. Add sugar and mix. Gradually add eggs and vanilla; mix well. 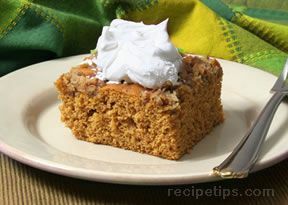 Note: 3 cups of cake flour can be substituted for the 2 5/8 cups of all-purpose flour and 3/8 cup of cornstarch if preferred. Cut black licorice pieces to make the eyes and mouth of the pumpkin face. 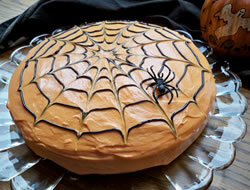 Add spider rings to the cake. The cake is ready to serve. 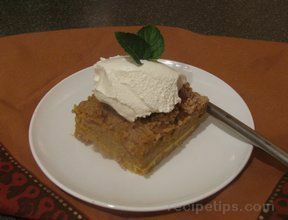 If not serving immediately, cover and place in the refrigerator. Note : Store bought frosting could be used or any of your favorite homemade frostings recipes could be used as long as it is firm enough. "I made this cake and tried to decorate as close as possible to the picture on the recipe. My grandkids really got a kick out of it. It was a lot of fun. I think I baked my cake a little too long because it was a little dry but tasted good. Next time I will bake it for a little less time."